In his 30 years with the Los Angeles County Sheriff’s Department, Detective Gerardo A. Pachuca has seen just about everything. Since 2002, he has been a member of Cargo CATS, the department’s team of experienced investigators and one of a handful of multiagency teams in the United States dedicated exclusively to targeting cargo thieves and their receivers. His team investigates some 125 reported cargo thefts a year in his jurisdiction of Los Angeles County, which is one of the nation’s most active regions for cargo theft. Every type of trucking company can be a target, he noted, adding that many victims had loads that were “double brokered,” in which the shipment was booked originally with a legitimate carrier, whose drivers were too busy to handle the load. That carrier then rebrokered the load to an independent owner-operator. “The bad guys look for owner-operators” for that reason, Pachuca said. Thieves are becoming increasingly sophisticated and organized, he said. They work in crews, casing specific warehouses and companies. Sometimes they have a buyer already lined up requesting specific products they want to “fence” or sell; the thieves will then research, surveil and target warehouses and trucks with those goods. In his investigations, Pachuca has found that a lot of cargo theft suspects have been in the transportation industry at some point, working in a warehouse or as a truck driver. “They already know a door lock on a tractor can be easily jimmied or defeated,” he said. 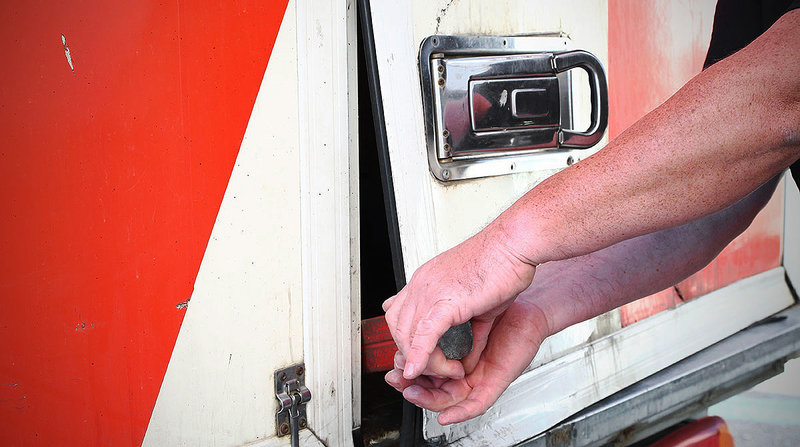 Some thieves even carry their own ignition switches, so once they break into a truck, they change out the entire switch, start the truck and take off. “It takes about 30 seconds” to change an ignition switch, Pachuca said. In one case, he was running surveillance on a suspected crew of cargo thieves and watched as they followed a truck from a local warehouse, where it parked just a couple of miles away. No theft occurred at that time, but he contacted the driver with a warning that he was being tracked. That shipment wasn’t stolen. But a week later, the driver followed the same route and used the same parking lot, leaving the trailer unattended. This time the thieves struck, stealing the entire trailer. His advice to truck drivers: Stick with company protocols for safety, security and theft prevention practices.